I finished The Long-Winded Lady, notes from The New Yorker by Maeve Brennan. It’s a collection of pieces printed in The New Yorker magazine in the”Talk of the Town” column, and I enjoyed it a lot. Review coming Friday. I’m still reading through the graphic novels that got ruined, and it’s taking longer than I thought. I finished the last two StormWatch collections, A Finer World and Final Orbit (covers in last week’s post). Also read were a Nightwing graphic novel, On the Razor’s Edge, two Superman collections, The Death of Superman and World Without A Superman and two collections of a comic by artist/writer Tony Daniels, The Tenth – Abuse of Humanity and The Tenth – The Black Embrace. When I bought these in 1997-1998, I particularly liked Daniels’ art style, with it’s elongated figures and drenched colors. Barbara, meanwhile read Henning Mankill’s The Fifth Woman until it was due back at the library, then waited a week or so until it came around again. She’s nearly finished with it now, and as always with Mankill, she’s really enjoying it. She’s also still doing a lot of of quilt work, so reading time has been a little limited, plus both of us have been watching the Olympics, which takes many evening hours. This entry was posted in Books & Reading, current reading, Fiction, Graphic Novel. Bookmark the permalink. Just finished Revolver by Duane Swierczyski which I liked. Just started Another One Goes Tonight-the new Peter Lovesey and the new China Mieville-The Last Days of New Paris. Am also reading the new collection by Michael Swanwick-Not So Much Said the Cat. My TBR pile is getting way out of hand. Just picked up Moskva by Jack Grimwood(Jon Courtney Grimwoods pseudonym) and new novels by Paul Tremblay, Todd Robinson and Nick Mamatas. We’re out at a mall so the list will have to wait until I get back to the hotel to check, but I did read the 1912 (I think) Csrnacki the Ghost-Hunter collection of stories by William Hope Hodgson. He’s an occult detective, and not all the stories seem to have a human instigator behind the crimes (though some do). You’d probably enjoy them, and they are easy to find in an ebook format. I read the two-part Harry Potter play that George trashed this morning, and liked it more than he did, obviously. Harry Potter and the Cursed Child. I agree the Ghost Hunter book sounds interesting. I’m realizing there’s a lot of horror element in some of the graphic novels I’m reading more than I remembered, which is surprising me. I have no intention of reading that Potter play. If I were going to read a play, I’d choose one by Neil Simon. I look forward to the review for the The Long-Winded Lady. 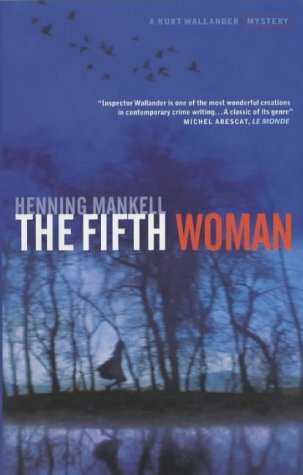 I have just been watching series 4 of Wallander (the Branagh series) and I am wanting to read more of the Wallander books myself. I have only read the first one. Barbara got a DVD of the first season of Wallender from Netflix but has only watched the first episode so far. The review will be my Friday Forgotten this week. After finishing two Elizabeth Candell mid-century romance/gothics and returning two Melissa Scott science fiction books to the library unread (when it comes to SF, I really have to be in the mood), I grabbed a book from my recent haul at the Friends of the Library sale: Betty Rowlands’s A LITTLE GENTLE SLEUTHING, published in 1990. I was unfamiliar with Rowlands and, based on this rather slow-paced mystery about a writer who leaves London for a rustic cottage and stumbles upon corpse, I’m not sure I’ll be seeking out more by her. Deb, I hope you had a good vacation, and I expect you’re either back in harness at school or in the prep stages therefore. I have to be in the mood for SF too, but it seems I’m in that mood quite often, lately I’ve been reading more of it than mystery, though I’m working my way through a hard-boiled anthology for the special FFB in September. Reading these graphic novels is slowing me down, but I feel I have to give them another look through before I just chuck them. There may be some that aren’t ruined, which I’ll either keep or donate. That scenario for A Little Gentle Sleuthing certainly matches the title, and I’m occasionally in the mood for that the kind of thing. I just got The Methods of Sergeant Cluff, which I have hopes for. Of course I did read the Brennan book last week. I had Revolver from the library but returned it unread because I had too many other things on hand. I downloaded a fantasy book but may return it. Also read: Movie Stars by Jack Pendarvis, an amusing short story collection; The Pursuit by Janet Evanovich and Lee Goldberg, the latest in their Fox and O’Hare series, which I enjoyed but less than the last one; and You Will Know Me by Megan Abbott, which was really excellent. I got Survivors Will Be Shot Again by Bill Crider, the new Sheriff Rhodes novel – thanks, Maggie – and I am reading it now. I know I have library books by Stewart O’Nan, P. J. Tracy, and Colin Cotterill at home, among others. Busy, busy, busy. Hope you’re having a nice time in D.C. I haven’t read any of the Fox and O’Hare books, though the concept sounds interesting. I’m simply so far behind on reading, and now with the graphic novels, that anything new to me in the way of authors or series is out of the question. Aside from the forthcoming Krueger and Penny books, I’m only reading off my shelves. I’m having that terrible “I’ll die before I can read it all” feeling and I admit it’s getting me down. Barbara was gone for the day, with her quilting friends, and I got through 3 graphic novels, but nothing else. I think I’ve read the first 2 Cotterill books, and the the next 2 on the shelf, but I forget about them unless I go and look at those shelves, or scan my catalog. It’s really overwhelming. Noah Hawley’s BEFORE THE FALL and SEINFELDIA, which is more about the writing of the show than the plots or actors. Interesting but a bit dry. Yes, sounds dry. I saw something on the Hawley recently, but can’t recall what. Michael Swanwick”s Not So Much Said the Cat.arrived last week. I’ll probably read it when I’m back to work in a few weeks. I’m still reading Big Fat Books but my window for reading them is closing fast. So the Swanwick is a sequel to The Dog Said Bow-Wow, right? Not a sequel. It’s a collection of short fiction. Kitty finished Stephen King’s END OF WATCH (she “really liked it”). so I’m reading it now. I’m also reading Neil Gaiman’s non-fiction collection THE VIEW FROM THE CHEAP SEATS. I’m pacing myself on this one — which I think is how it should be read. I read only one novel this week, John D. MacDonald’s movie tie-in I COULD GO ON SINGING, my FFB this past week. JDM took a sappy movie and made an interesting read. Good, but not MacDonald at his best. Also this week, only one graphic novel: WAR OF THE GREEN LANTERNS: AFTERMATH by Tony Bedard, et al. I like this much better than the other Green Lantern stuff I’ve read because it takes a more focused approach with each section. Too many GNs have use a scattershot approach, constantly shifting action, plots, and characters, which, for me, makes a book a confused muddle. I did finish a number of anthologies this week, not one of which would appeal to you, Richard. I’d been sampling these books over the past month or so and finally completed five of them: Michael Cox & R. A. Gilbert’s THE OXFORD BOOK OF VICTORIAN GHOST STORIES and THE OXFORD BOOK OF ENGLISH GHOST STORIES, Richard Dalby’s THE MAMMOTH BOOK OF VICTORIAN AND EDWARDIAN GHOST STORIES, Stefan Dziemianowicz, Robert Weinberg, and Martin H. Greenberg’s NURSERY CRIMES, and Peter Haining’s THE MAMMOTH BOOK OF HAUNTED HOUSE STORIES. There are surprisingly few duds in these five anthologies. I have a few more horror anthologies I hope to finish off over the next few weeks. In addition to the King and the Gaiman, I hope to read Will F. Jenkins (a.k.a. “Murray Leinster) western SON OF THE FLYING “Y.” With luck, I’ll also get to HEX by Thomas Olde Heuvelt. Heavy rains, loud thunder, and spectacular lightning for much of this past week, but we have not floated away. Yet. I hope you and Barbara are having sunshine, rainbows, and lollipops this week. Be well. No rainbows or lollipops, but some sun mixed with cool rainy days, the kind of weather I like. It will warm up into the 80s later this week, but we’ve had a gentle August so far. The Leinster sounds of interest, a western, I assume. Is it a YA? The Leinster is a western, one of two he did for Gold Medal. (The other is the movie tie-in for the 1950 Gary Cooper flick DALLAS.) I’d say SON OF THE FLYING ‘Y’ is an “adult western,” but that has a different connotation today. It’ll probably be my FFB this Friday.